Awhile ago, I found the above bureau in a dumpster. Someone had decided to get rid of it, and instead of selling it or donating it, they decided it should end up at the dump instead. There was nothing wrong with it, and I happened to need a bureau, so we brought it home, cleaned it up, and used it in our bedroom. Use number 1. Not long after that, I refinished the bureau. In fact, it was the first thing I ever refinished, which means that not only did I gain a bureau from this dumpster dive, I learned a new skill. (I kind of did a crappy job, to be honest, but this is how you learn, right?) Use number 2. We used the bureau for four years, then we upgraded our bedroom set and no longer needed it. But my husband needed something to hold his tools, so we moved the bureau to the garage and loaded it up. Use number 3. Then last August, someone gave my husband a nifty cabinet for tool storage, so we decided to get rid of the bureau. I put an ad on Craigslist and we sold it that same day for cold hard cash. Use number 4. 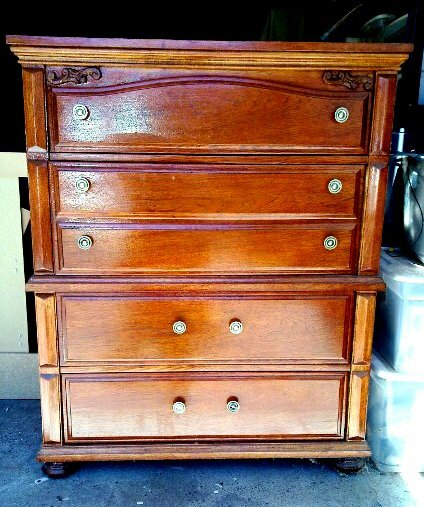 So to recap: we got the bureau for free and used it for six years. During that time, it had four separate uses that benefited us, not the least of which is that we came out of the endeavor with a profit! Compare that to people who buy furniture for high prices and then throw it out when they are done with it. This is frugality in action, don’t you think? If you have a similar story, please share! My favorite dumpster find was a 3 shelf rubbermaid cart. One of those on wheels storage thingies, only in clear pink plastic, with sparkles…It was placed beside the dumpster 5 years ago, and was totally covered in stickers. I happily pulled it into my yard, and left it sit outside overnight. Being that it was middle of winter on the Canadian prairies, it was really cold, and the sticker just flaked off. That storage cart has been a pattern case-for my sewing patterns-a toy box for my daughter-for 3 years-and has now reverted to a pattern case, yet again. Last year I found out that it was tossed by the teenager across the lane from us, because she didn’t like the stickers she had put on it. Her loss, our gain. I have many favorite dumpster dive finds, including furniture, art work etc. To many to list really. But Great job on the long life of your find. I am sure the bureau id still in use, considering a fellow craigslist user bought it.